William Mitchell sits between architect, science fiction writer, and perpetual optimist. The world needs more people like him – if only to combat the ecological pessimists, and baby-boomer guilt. His enthusiasm for the future of architecture helped spawn the MIT Media Lab, and gave rise to some particularly entertaining books (ME++ and The City of Bits, among others). Like anyone who predicts the future, Mitchell is wrong more than he is right. He is definitely wrong in The logic of Architecture. However, the myth Mitchell tells in The logic of Architecture is not interesting for Mitchell’s incorrectness, but for what this incorrectness can teach us about our own myths. We can express architecture as words, and these words can be expressed in a logical syntax. We can use grammar to anticipate what will come next in the logical syntax. We can use this to design architecture. One of the most valuable lessons I learnt at architecture school was to be cautious of anyone speaking about binaries – they are most likely wrong. Mitchell is no exception. Many of his grammar rules are based on the idea of something being ‘adequate’; the structure is adequate to hold up the building, the room is adequately proportioned for the function, ect. These are all binary conditions, the structure is either adequate or the structure is not adequate. This naive view of the world masks one of the biggest problems with Mitchell’s system: in the real world there are degrees of adequacy and the architect’s main job is satisficing the conflicting objectives of a project. Resolving conflicting goals in a digital system remains an unsolved problem, and a significant one at that. I will return to this point at the end, but in short, the real world is far more complex than we often assume it to be – and binaries are a give away that something is oversimplified. Mitchell’s logic language describes how something looks and how it relates to other objects. For example you could say the wooden block is on the metal table. In our ocularly dominated world this makes sense, but I can’t help but wonder how Mitchell would describe Wikipedia if he saw it. 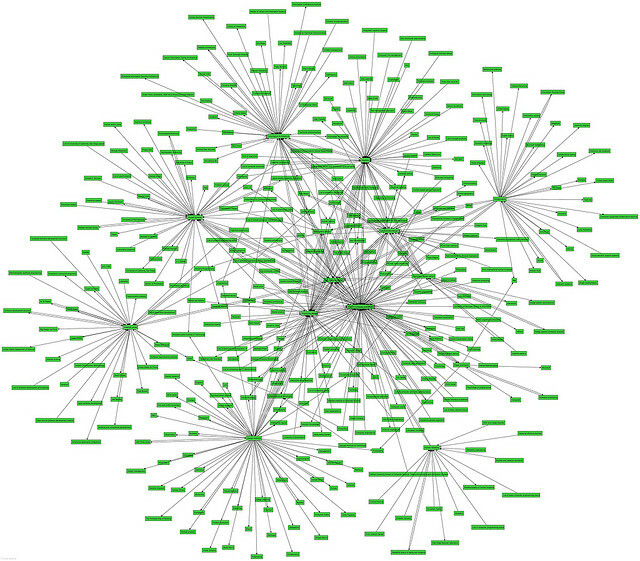 It is tempting to describe W as a network of links, since this is how we perceive Wikipedia when we use it. The diagram for this would be like the one above, times about a million – a super complex description. However in reality Wikipedia is structured like the diagram below, pretty simple. I would love to think such a diagram exists for architecture, and we can get away from these verbose descriptions of what something looks like, and go into the true logic of the object. Just like there are many ways to describe Wikipedia, there are many ways to describe architecture. Mitchell’s development of a language in The Logic of Architecture is not particularly novel. But what is interesting is his realisation that languages defines the scope of architectural possibility (the search space) and the best language defines all the design options we would possibly want, without being cluttered with the ones we do not want. So when Mitchell shows an image of Tarski’s World, I am blown away anyone would want to design with it (you can with this java applet). But then again, scripting is not the most obvious way to describe a building. It is interesting to think of Grasshopper, and GC and Processing, in twenty years time, looking as clunky as Tarski’s World. I wonder what part of the design space we are currently missing by describing our buildings through mathematics. Confirmation bias runs rampant in architectural academia. It is too easy to design a new way of producing architecture, test it on an idealised project and then extrapolate that you have changed the world. Or alternatively (as apparently happened at ACADIA this year) look to French continental philosophers as confirmation of your correctness. Had Mitchell tried to produce more than reproductions of 1:200 plans in The Logic of Architecture, I am sure he would have reconsidered his thesis in light of the gritty reality of real projects. In Mitchell’s time this would be a tall ask, but today, with so much of the underlying technology in place, there is not reason not to make these tools. So along with anyone talking in binary, I am immensely suspicious of anyone who describes a theoretical design tool, or one only tested on hypothetical projects. Thankfully Mitchell gave up doing this after The Logic of Architecture and just started telling us how the world was going to be – and Michell’s reality is not bad at all. And with that, I think Digital Morphogensis is officially one year old, thank you to all the readers, commenters and twitters for helping make it happen. 11 December 2011: Tarski’s world was mistakenly called Peano’s World. Thank you to Ruwan for catching this. Thanks for this post. I remember reading the logic of architecture myself and coming to the same conclusions – it is however, a very well written thesis. Architecture cannot be measured quantitatively in isolation of course – it’s very much real, in the flesh, there to be experienced and certainly not able to be encapsulated using binary shape grammars or by twisting the writings of certain French philosophers (naming no names)… but at least it’s a start I guess! Pretty much all of it!! Ha, John you are too right. I guess a better question would be, how much longer will we ignore the majority of the design space by designing our buildings with mathematics. And will mathematics evolve to include these design spaces or will it be replaced? 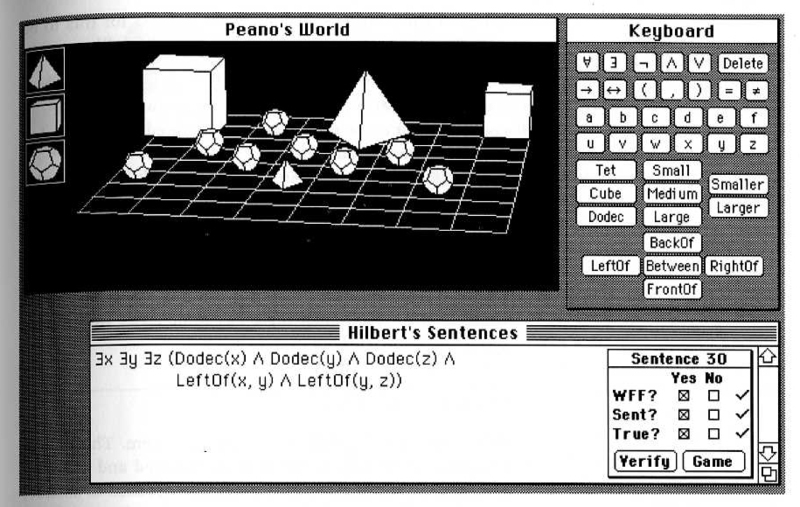 Hey Dan – was re-reading the book – I think the program is actually called ‘Tarski’s World.’ Peano’s world is the document thats open with the program in the image – am really not sure how the image is related to Peano’s maths though! Hope is well at SIAL. Thanks for picking that up Ruwan!